The New-York Historical Society's furniture holdings number more than 500 objects, including seating furniture, tables, case furniture, cradles, clocks, and boxes ranging from a late 17th-century Dutch kast to a pair of 1960s Bertoia chairs. The earliest acquisition, a chair made for Marie Antoinette's private chambers at Versailles in 1779, was purchased by U.S. Minister to France, Gouverneur Morris. Highlights of the collection include George Washington's inaugural armchair and Valley Forge camp bed, a rococo carved Philadelphia high chest, ten pieces of furniture used by the first United States Congress at Federal Hall, a lady's cabinet dressing table owned by the Livingston family, the Abeel family French press made by French émigré Charles-Honoré Lannuier, and the desk at which Clement Clarke Moore wrote "A Visit from St. Nicholas." 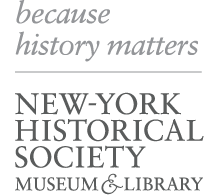 The New-York Historical Society possesses one of the finest collections of early American silver in the nation, a trove of some 3,000 silver items. Many of these objects, which range from simple spoons to extravagant trophies, were family heirlooms donated by descendants of the original owners. Highlights include the magnificent salver (tray) made by the Swiss-born New York City silversmith Lewis Fueter in 1772 for presentation to British engineer Thomas Sowers, a 381-piece silver dinner service given to Commodore Matthew Perry for negotiating the opening of Japanese ports to United States trade, and the Tiffany & Co. controller handle used by Mayor George McClellan to operate the first New York City subway train on its maiden voyage in 1904. The New-York Historical Society’s extensive holdings of ceramics and glass holdings reflect domestic use from the 18th century to the present day. New York stoneware is well-represented, including early examples by Manhattan potters such as Clarkson Crolius, Sr. and Thomas Commeraw. The collection also includes significant holdings of English creamware for the American market, transfer-printed Staffordshire with New York views, and Chinese export porcelain. More recent acquisitions include 20th century tablewares by designer Eva Zeisel. The glass collection includes a wide representation of blown, molded, and pressed glass wares made in the U.S. during the 19th century. The New-York Historical Society houses one of the world’s largest collections of Tiffany lamps, acquired as a gift from collector Egon Neustadt in 1984. The 132 lamps include rare examples, such as the Cobweb, and iconic shade models including the Wisteria, Dragonfly, and Magnolia. The lamps are supplemented by working drawings, glass sheets, and tools used to create the famous leaded-glass shades. The New-York Historical Society houses approximately 2,000 textiles, ranging from intricate schoolgirl needlework and sumptuous woven coverlets to printed campaign kerchiefs and patriotic, painted banners. The distinguished collection of flags and banners, numbering some 400 objects, includes flags used in every major conflict with an American presence between the Revolutionary War and World War II. A large collection of printed textiles includes over 100 political kerchiefs documenting presidential campaigns from 1840 to 2008.